Join us for the Miss Bush Bridal Fair! This fantastic evening will begin with a drinks and canape reception followed by a Q&A with a panel of industry experts who will explain exactly how to plan your perfect marquee wedding. The evening offers a real chance to quiz the experts on the logistics, design and installation of an outdoor venue, with a focus on the Autumn and Winter seasons. 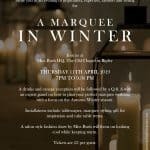 Installations at this exciting event will include our fabulous marquee, plus tablescapes, marquee styling tips, gift list inspirations and cake table treats. 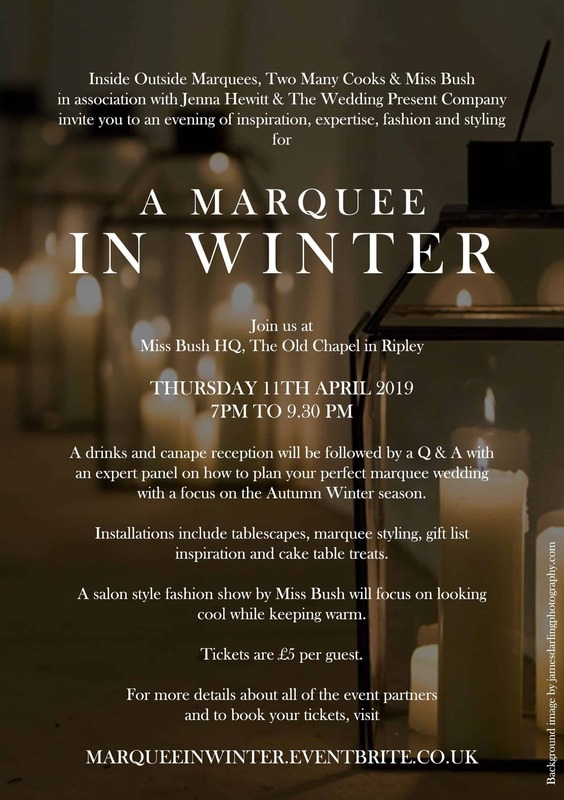 One of the highlights of the evening will be a salon style fashion show by Miss Bush, focusing on looking cool while keeping warm! Tickets are on sale for just £5 per guest, just click here to find out more and to book your place; hurry, this is a small and intimate event and places are limited! So, who should come along? 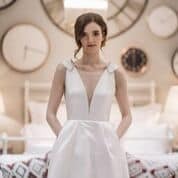 Regardless of whether you’re planning a winter or summer wedding, you never know when the British weather is going to toss you a curve ball; this is your chance to grill the experts and uncover the best in contingency planning tips. Anyone considering a marquee venue versus a traditional bricks and mortar venue. Whilst it’s fairly easy to arrange a viewing at a traditional wedding venue, it can be almost impossible to set up a visit to a wedding marquee. 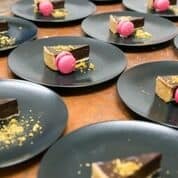 Bricks and mortar venues usually offer a variety of set wedding packages, they use the same, popular spots for taking the wedding snaps and they have a predetermined way of laying out the dining space for the wedding breakfast. A marquee venue is unique. Marquees offer the opportunity to create something bespoke and personal to you and this is your opportunity to discover just how flexible a temporary venue can be. If you are hosting a marquee event for the first time in your garden or fields then come along and find out everything you’ll need to know. Perhaps you are considering hosting a marquee, but you’re not sure whether your garden space will work. The experts will be there so come along and pick their brains. 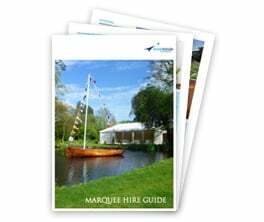 Inside Outside have built marquees in all kinds of unusual spaces such as over lakes and ponds, swimming pools and across tiered and heavily sloping gardens. You’ll be amazed at what can be done. 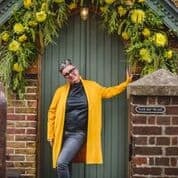 Find out how a photographer deals with varying lighting conditions, which flowers will be in season, how to ensure your guests aren’t cold, plus how to look cool whilst keeping warm! Congratulations – it’s an exciting time for you! 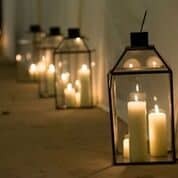 Come along and meet a selection of carefully selected, top tier wedding suppliers. 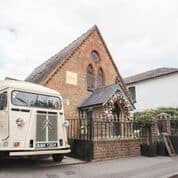 With the bridal fair being hosted at Miss Bush’s beautiful, intimate Chapel HQ, it’s the perfect opportunity to ask questions in a friendly, informal environment – and you won’t have to fight your way through the crowds usually found at large scale wedding events. Inside Outside provide premium level marquees for weddings and life’s milestone occasions. If you can’t make it along to meet the team at the bridal fair on the 11th April then please give us a call to talk about your wedding plans. We love weddings and we’re happy to offer free, no obligation advice, quotes and site visits!